Here is simple and low-cost optical burglar alarm circuit project. It is a very easy to build this electronic circuit project. 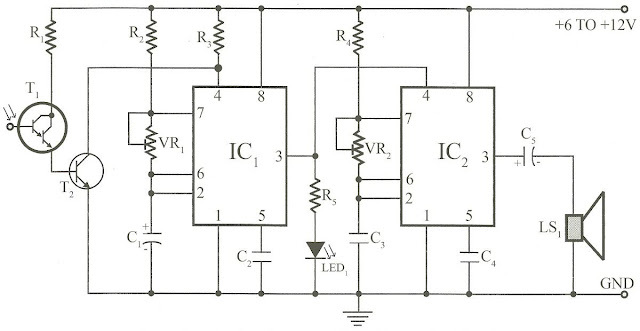 This electronic optical burglar alarm circuit project uses two 555 timer ICs (IC1 & IC2). Both the ICs are wired as astable multivibrators. 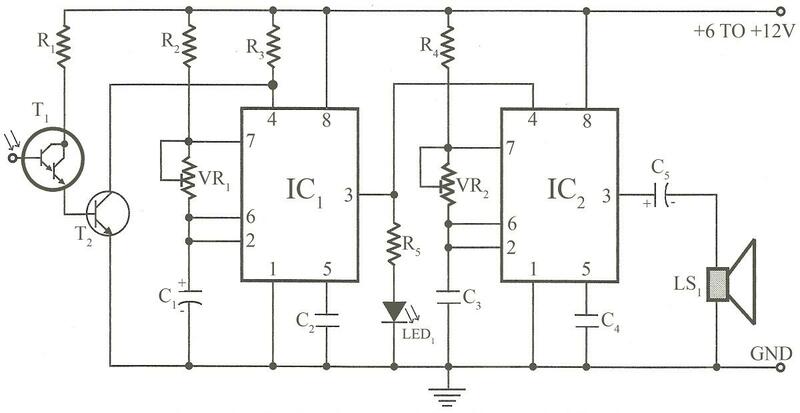 The first astable multivibrator built around IC1 produces low frequencies, while the second astable multivibrator built around IC2 produces audio frequencies. General-purpose Darlington photo-transistor T1 is used as the light sensor. To increase the sensitivity of the circuit, NPN transistor T2 is used. Place phototransistor T1 where light falls on it continuously. Phototransistor T1 receives light to provide base voltage to transistor T2. As a result, transistor T2 conduct to keep reset pin 4 of IC1 at low level. This disables the first multivibrator (IC1) and hence the second multivibrator (IC2) also remains reset so the alarm (LS1) does not sound.